Moss Rock offers the best combination of modern amenities without forgetting the classic experience of a mountainside cabin. The cabin features a beautifully designed interior, oak hardwood floors, one queen bed downstairs and two queen beds in a second story loft, an oversized deck and a stone fire pit outside. You, your family and friends will love the one of a kind experience this cabin has to offer. Starting this spring, Moss Rock also features new solar panels!! Charge your phone and other small electronics as well as run lights or music from the sun! Six PV panels are roof mounted and the rechargeable battery is located under the granite countertop, so you can enjoy electricity AND the solitude of the backcountry experience in this truly unique and beautiful structure and location. Moss Rock is conveniently located in the heart of Red River Gorge minutes from the Martins Fork trail head and is the closest cabin to popular rock climbing spots like Left Flank. Whether you are enjoying the 5 minute hike to Left Flank, soaking in nearby swimming holes, engaging in kayaking or zip lining adventures or relaxing by the campfire you will be sure to find your much needed rest and relaxation at this spectacular cabin. 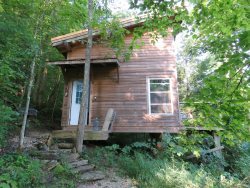 Moss Rock cabin is simply the best OFF THE GRID getaway with conveniences for those looking to enjoy nature’s beauty. *IMPORTANT*This shelter has battery operated lanterns and natural lighting. This shelter does not have regular electricity, but does have a solar powered battery to run small lights and recharge electronics. Moss Rock is equipped with hand operated water pumps both for the kitchen sink and bathtub. There is no regular running water in the cabin or outhouse. *IMPORTANT*This cabin is extremely secluded and uniquely built into the nature’s hillside. A short hike up an aggressive gravel incline is required in order to reach this private oasis. Please read the additional notes at the bottom of this page for more information. Moss Rock is an off-grid cabin experience unlike any other. While you’ll be saying good-bye to our many modern conveniences, you’ll get to say “HELLO!” to solar-powered lighting, battery-powered lanterns, pump and gravity fed plumbing and propane appliances. We hope you’ll enjoy our low-tech approach to a high-quality experience during your stay! Kitchen: Fully featured kitchen including a gas stove, oven, 75L Yeti cooler, foot-powered sink station, and french press coffee pot. Cookware, dishware, soap and kitchen linens will be provided during your stay. Living/Dining: Bar-style countertop seating in the kitchen, a futon couch by the fireplace, and a furnished deck with a stellar view. The upstairs loft has its own balcony as well. Bathroom: The shower in Moss Rock is what some might call…..ingenious! Human-operated and gravity-delivered, this is not your average backwoods shower. Fill ‘er up from the kitchen sink or right off the stovetop (for a warm and toasty treat! ), hoist the bucket onto the pulley system and voila! Shower-in-a-bucket is at your service. And when “nature calls”, simply head down to your private composting outhouse. Of course, you are always welcome to use the guest shower and bathroom located at the Red River Gorgeous Headquarters at any time during your stay. Bedroom: A queen size bed and full futon are located on the main level, and there are two additional queen beds on the upper level. Additional Amenities: Weber charcoal grill, porch swing, indoor propane fireplace, solar-powered ceiling fan, board games and a private fire pit. Moss Rock also has a solar-powered charging station for small electronics. Linens are available upon request! You are more than welcome to bring your own linens. Otherwise, we offer linens for an additional $10 per bed / bunk bed. This includes complete bedding and a bath towel. Please indicate on your reservation if you would like us to supply linens during your stay and the number of bed sets desired. Firewood is also available upon request. For $20 we will deliver firewood to your fire pit. Please be sure to mark on your reservation if you would like firewood delivery. Please be sure to put out all fires COMPLETELY when you are finished and do not harvest from our woods.